INTRODUCTION: Oral drug delivery is the simplest and easiest way of administering drugs 1, 2. Because of the greater stability, smaller bulk, accurate dosage and easy production, solid dosage forms have many advantages over other types of oral dosage forms. Therefore, most of the new chemical entities under development these days are intended to be used as a solid dosage form that originate an effective reproducible in vivo plasma concentration after oral administration 3, 4. In fact, most new chemical entities are poorly soluble drugs, not well-absorbed after oral administration 4, 5, which can distract from the drug’s inherent efficacy 6-8. Drug absorption from the gastrointestinal tract can be limited by a variety of factors; Most significant contributors being poor aqueous solubility and poor membrane permeability of the drug molecule. When delivering an active agent orally, it must first dissolve in gastric and/or intestinal fluids before it can permeate the membranes of the GI tract to reach systemic circulation. Hence two areas of pharmaceutical research that focus on improving the oral bioavailability of active agents include; Enhancing solubility and dissolution rate of poorly water – soluble drugs enhancing permeability of poorly water-soluble drugs 9. Lipid-based delivery systems are becoming increasingly popular as carriers of drugs because of their ability to bypass some of the more resistant chemical and physical barriers associated with poorly absorbed drugs. Examples of lipid based drug delivery systems include conventional emulsions and microemulsions and more recently liposomes, microspheres, solid-lipid nanoparticles, cubosomes 10. Consequently, if the drugs are not completely released in the gastrointestinal area, they will have a low bioavailability 11, 12. Therefore, one of the major current challenges of the pharmaceutical industry is related to strategies that improve the water solubility if drug 6, 14, 15. Drug release in a crucial and limiting step for oral drug bioavailability, particularly for drug with low gastrointestinal solubility and high permeability. By improving the drug release profile of these drugs, it is possible to enhance their bioavailability and reduce side effects 11, 15, 16-18. Solid dispersions are one the most successful strategic approach to improve drug release of poorly soluble drugs. These can be defined as a molecular mixture of poorly water soluble drugs in hydrophilic carriers, which present the drug release profile that is driven by the polymer properties. For a drug to be absorbed it must be present in the form of an aqueous solution at the site of absorption 19. Therapeutic effectiveness of a drug depends upon the bioavailability and ultimately upon the solubility of drug molecules. Drug release is a crucial and limiting step for oral drug bioavailability particularly for drugs with low gastrointestinal solubility and high permeability. By improving the drug release profile of these drugs it is possible to enhance their bioavailability and reduce side effects. A review of new monograph (1992-1995) in European pharmacopoeia shows that more than 40% of the drug substances have aqueous solubility below 1mg/ml20 and the 32% have an aqueous solubility below 0.1mg/ml. Aqueous solubility of greater than 1 per cent (1 g/100 ml) usually indicates that no potential problems in absorption resulting from the solubility characteristics of the compound need to be anticipated. However, the 1 percent solubility limit is an arbitrary guideline and in no way represents a universal limitation in terms of solubility and absorption relationship. Mechanism of Solubilization21: Drug solubility is the maximum concentration of the drug solute dissolved in the solvent under specified conditions of temperature, pH and pressure. The drug solubility in saturated solution in a static property where as the drug dissolution rate is a dynamic property that relates more closely to the bioavailability rate. The solubility of a weak acid or weak base varies considerably as a fraction of pH. This equation indicates that the solubility of weak acid increases with the increasing pH solubility is optimal at higher pH. This equation indicates that solubility of weak base decreases with increasing pH solubility is optimal at lower pH. With the recent advent of high throughput screening of potential therapeutic agents, the number of poorly soluble drugs candidates has risen sharply and the formulation of poorly soluble compounds for oral delivery now presents one of the most frequent and greatest challenges to formulation scientists in the pharmaceutical industry. Dissolution: The transfer of molecules or ions from a solid state into solution is known as dissolution. In essence when a drug dissolves, solid particles separate and mix molecule with the liquid and appear to become part of that liquid. Therefore drug dissolution is the process by which drug molecules are liberated from a solid phase and enter into a solution phase. If particles remain in the solid phase once they are introduced into a solution, a pharmaceutical suspension result. In the vast majority of circumstances, only drugs in solution can be absorbed, distributed, metabolized, excreted or even exert pharmacological action. Thus dissolution is an important process in pharmaceutical sciences. Fundamentally the process is controlled by the relative affinity between the molecules of the solid substance and those of the solvent. The extent to which dissolution proceeds under a given set of experimental condition is referred to as the solubility of the solute in the solvent. The use of poorly soluble drugs has a number of drawbacks such as increasing the dosage form, administration frequency and the resultant occurrence of side effects 22. The formation of higher energy metastable states of the components as a function of the carrier system being used and the proportion of carriers present 23. The reduction of particle size to nearly a molecular level 24. As the soluble carrier dissolves, the insoluble drug is exposed to dissolution medium as very fine particles leading to an increase in both surface area and solubilization for fast dissolution and absorption. Formation of amorphous forms of drug and carriers 25. The presence of carrier may also prevent aggregation of fine drug particles, thereby providing a larger surface area for dissolution. The wetting properties are also greatly increased due to the surfactant property of the polymer, resulting in decreased interfacial tension between the medium and the drug, hence higher dissolution rates. The presence of carrier polymers also inhibits crystal growth of the drug which facilitates faster dissolution. Co solvent effect on the drug by the water soluble carriers. Intermolecular hydrogen bonds between drug and carrier 26. Local solubilization effect of carrier at the diffusion layer. Consideration of the Noyes-Whitney 27 equation provides some hints as to how the dissolution rate of poorly soluble drugs might be improved to minimize the limitations of oral bioavailability. C= concentration of drug in the medium at time t.
The main possibilities for improving dissolution according to this analysis are to increase the surface area available for dissolution by decreasing particle size of the solid compound and /or by optimizing the wetting characteristics of the compound surface, to decrease the boundary layer thickness, to ensure sink conditions for dissolution and, last but definitely not least, to improve the apparent solubility of the drug under physiologically relevant conditions. Of these possibilities, changes in the hydrodynamics are difficult to invoke in vivo and the permeability of sink conditions will depend on how permeable the gastrointestinal mucosa is to the compound as well as on the composition and volume of the luminal fluids. Although some research effort has been directed towards permeability enhancement using appropriate excipients, results to date have not been particularly encouraging 28. Many advanced solubilization technologies developed by companies specializing in drug delivery. These strategies include the solubilization and surfactants, the use of different polymorphic/amorphic drug forms, the reduction of drug particle size, the complexation (e.g., cyclodextrins) and the formation of solid drug solutions/dispersions. (caprolactone) -b- poly (ethylene oxide). Biopharmaceutical Classification System: The BCS has proven to be an extremely useful guiding tool for the prediction of in vivo performance of drug substances and development of new drug delivery system to suit the performance of drug in the body, as also for the regulation of bioequivalence of drug product during scale up and post approval. The development of dosage form especially for prolonged release has been a challenge to formulation scientists because of many independent factors governing the absorption from the gastrointestinal tract 30. For this purpose the drug substances are categorized into four classes based on their solubility parameter and permeability to biomembranes and such a classification system is called as a biopharmaceutical classification system 31. The BCS was first devised in 1995 by Amidon et al and since then it has become a benchmark in the regulation of bioequivalence of oral drug products. The BCS serves as a guiding tool to improve the efficiency of drug development by proper selection of dosage form and bioequivalence tests, to recommend a class of immediate release (IR) solid dosage forms, for which bioequivalence may be assessed based on in vitro dissolution tests and to lay the effect of excipients on drug permeability. A drug substance is considered highly soluble when the highest dose strength is soluble in £ 250 ml water over a pH range 1 to 7.5. A drug is considered highly permeable when the extent of absorption in humans is determined to be 90% of an administered dose, based on the mass balance or in comparison to an intravenous dose. A drug product is considered to dissolve rapidly when 85% of the labeled amount of substance dissolves within 30 minutes, using USP apparatus I or II in a volume of £ 900 ml buffer solution. Class I: High Permeability, High Solubility: In-vivo these drugs behave like an oral solution having fast dissolution and rapid bioavailability. Since the dissolution and absorption of class I drugs is very fast, bioavailability and bioequivalence are unnecessary for the products of such drugs. These drugs are good candidates for controlled drug delivery if they qualify pharmacokinetically and pharmacodynamically for the purpose. Gastric emptying is often the rate governing parameter in this case. 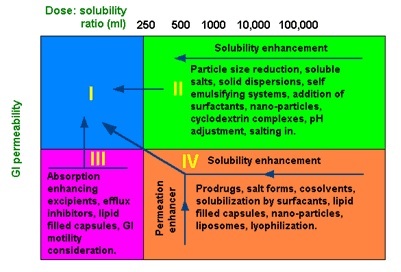 Class II: High Permeability, Low Solubility: Drugs belonging to this class have low solubility and high permeability, hence, the dissolution rate becomes the governing parameter for bioavailability. These drugs exhibit variable bioavailability and need enhancement in the dissolution rate by different methods for improvement in bioavailability. These are also suitable for controlled release development. Class III: Low Permeability, High Solubility: Permeation through the intestinal membrane forms the rate-determining step for these drugs. Since absorption is permeation rate limited, bioavailability is independent of drug release from the dosage form. For example, the various ranitidine products having different dissolution profiles produce super-imposable plasma concentration versus time profile in-vivo. These drugs generally exhibit low bioavailability and permeability enhancement is generally required. These drugs are problematic for controlled release development. Class IV: Low Permeability, Low Solubility: Drugs of this class exhibit poor and variable bioavailability. The overall bioavailability is governed by several factors such as rate of dissolution, intestinal permeability, gastric emptying, and so on. These drugs are generally not suitable for oral drug delivery or else some special drug delivery technologies such as nanosuspensions will be needed. Extension to BCS: (BCS Containing Six Classes): Bergstrom et al devised a modified Biopharmaceutical Classification System, in which they categorized the drugs into six classes based on the solubility and permeability 33. The solubility was classified as “high” or “low” and the permeability was allotted as “low”, “intermediate,” or “high”. This new classification was developed based on the calculated surface area descriptors on the one hand and solubility and permeability on the other. Surface areas related to the non- polar part of the molecule resulted in good predictions of permeability. It was quantitatively concluded that these models would be useful for early indication with regard to the absorption profiles of the compound during the early stages of drug discovery so that the necessary modifications can be made to optimize the pharmacokinetic parameters. 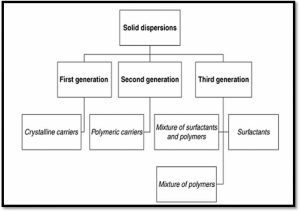 Solid Dispersion: Solid dispersion refers to a group of solid products consisting of at least two different components, generally a hydrophilic matrix and a hydrophobic drug. The matrix can be either crystalline or amorphous. The drug can be dispersed molecularly, in amorphous particles (clusters) or in crystalline particles34. Chiou and Riegelman, in their classic review, defined these systems as ‘the dispersion of one or more active ingredients in an inert carrier matrix at solid-state prepared by the melting (fusion), solvent or melting-solvent method, while Corrigan suggested the definition as being a ‘product formed by converting a fluid drug-carrier combination to the solid state’ 35. Simple Eutectic Mixtures: No review of solid dispersions would be complete without a brief description of eutectic mixtures, which are the cornerstone of this approach to improving bioavailability of poorly soluble compounds. A simple eutectic mixture consists of two compounds which are completely miscible in the liquid state but only to a very limited extent in the solid state (Fig. 2). When, a mixture of A and B with composition E is cooled, A and B crystallize out simultaneously, whereas when other compositions are cooled, one of the components starts to crystallize out before the other. Solid eutectic mixtures are usually prepared by rapid cooling of a co- melt of the two compounds in order to obtain a physical mixture of very fine crystals of the two components. When a mixture with composition, consisting of a slightly soluble drug and an inert, highly water soluble carrier, is dissolved in an aqueous medium, the carrier will dissolve rapidly, releasing very fine crystals of the drug. The large surface area of the resulting suspension should result in an enhanced dissolution rate and thereby improved bioavailability. 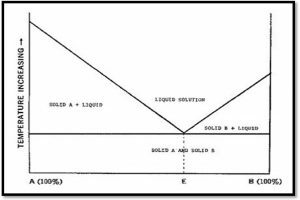 The concept of the solid dispersions was originally proposed by Sekiguchi and Obi, who investigated the generation and dissolution performance of eutectic melts of a sulfonamide drug and a water-soluble carrier in the early 1960s 2. Classification: Solid dispersion can be classified as shown in figure 3. It must be emphasized that the suitability of the solvent method to prepare simple eutectics or partial solid solutions remains to be studied further because their final physical properties may be quite different from those obtained by the melting method 3. 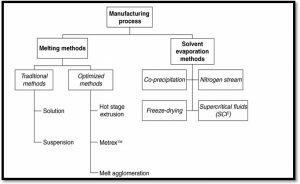 Manufacturing Processes: Melting and solvent evaporation methods are the two major processes of preparing solid dispersions 36 (Figure 4). Melting Method: Sekiguchi et al 2 were the first to use a melting method consisting of melting the drug within the carrier followed by cooling and pulverization of the obtained product. In the melting process, the molecular mobility of carrier is high enough to change the drug’s incorporation36. A common adaptation to the melting phase consists of suspending the active drug in a previously melted carrier, instead of using both drug and carrier in the melted state, reducing, therefore, the process temperature .To cool and solidify the melted mixture, several processes such as ice bath agitation 37, 38, stainless steel thin layer spreading followed by a cold draught 39, solidification on petri dishes at room temperature inside a dessicator 40, spreading on plates placed over dry ice 41, immersion in liquid nitrogen or stored in a dessicator 42, 43 were used. After cooling, the mixture must be pulverized regarding its handling. However, the use of high temperatures, and the fact that several drugs can be degraded by the melting process, can be a limitation of this method44. The incomplete miscibility between drug and carrier that may occur, because of the high viscosity of a polymeric carrier in the molten state, is another limitation of this process 45. To avoid the melting method limitations, several modifications, like hot-stage extrusion, Meltrex TM or melt agglomeration were introduced to the original method. Hot-stage extrusion consists of the extrusion, at high rotational speed, of the drug and carrier, previously mixed, at melting temperature for a small period of time. The resulting product is then collected after cooling at room temperature and milled 46, 47. A reduction in processing temperature can be achieved by the association of hot-stage extrusion with the use of carbon dioxide as a plasticizer 48, 49 which broadens the application of hot-stage extrusion to thermally labile compounds 48. Solid dispersions of para-amino salicylic acid/ethylcellulose, itraconazole/ PVP50 and itraconazole/ethylcellulose were successfully prepared by this technique. Moreover, it was observed that solid dispersions of itraconazole/inutec SP1 prepared by hot-stage extrusion presented itraconazole in a fully glassy state, whereas it was only partially glassy in solid dispersions prepared by spray drying 46. Meltrex TM is a patented solid dispersion manufacturing process, also on the basis of the melting process. The crucial elements in the Meltrex TM technology is the use of a special twin screw extruder and the presence of two independent hoppers in which the temperature can vary over a broad temperature range. This process permits a reduced residence time of the drug in the extruder, allowing a continuous mass flow and avoiding thermal stress to the drug and excipients. Additionally, it is possible that the application of this technique to protect drugs susceptible to oxidation and hydrolysis by complete elimination of oxygen and moisture from the mixture36. Melt agglomeration allows the preparation of solid dispersions in conventional high shear mixers. It is made by adding the molten carrier containing the drug to the heated excipients 50, 51, by adding the molten carrier to a heated mixture of drug and excipients, or by heating a mixture of the drug, carrier and excipients to a temperature within or above the melting range of the carrier 49. It is also possible to produce stable solid dispersions by melt agglomeration in a rotary processor 52. Solvent Evaporation Method: The solvent evaporation method consists of the solubilization of the drug and carrier in a volatile solvent that is later evaporated 38, 53. In this method, the thermal decomposition of drugs or carriers can be prevented, since organic solvent evaporation occurs at low temperature 54. A basic process of preparing solid dispersions of this type consists of dissolving the drug and the polymeric carrier in a common solvent, such as ethanol, chloroform 55, or a mixture of ethanol and dichloromethane. Normally, the resulting films are pulverized and milled. Super Critical fluid is the one where substances existing as a single fluid phase above their critical temperature and critical pressure, was shown to be efficient in obtaining solid dispersions 38, 54, 56. It ensured a very fine dispersion of the hydrophobic drug in the hydrophilic carrier 53. Carbon dioxide (CO2) is the most commonly used SCF because is chemically inert, non-toxic and nonflammable 57. This technique consists of dissolving the drug and the carrier in a common solvent that is introduced into a particle formation vessel through a nozzle, simultaneously with CO2. When the solution is sprayed, the solvent is rapidly extracted by the SCF, resulting in the precipitation of solid dispersion particles on the walls and bottom of the vessel 53. The use of processes using SCF reduces particle size, residual solvent content, without any degradation, and often results in high yield. Co-precipitation method, in which a non- solvent is added drop wise to the drug and carrier solution, under constant stirring. In the course of the non-solvent addition, the drug and carrier are co-precipitated to form microparticles. At the end, the resulted microparticle suspension is filtered and dried 58. Spraying on Sugar Beads using Fluidized Bed Coating: The approach involves fluidized bed coating system, where-in a drug-carrier solution is sprayed onto the granular surface of excipients or sugar spheres to produce either granules ready for tableting or drug-coated pellets for encapsulation in one step. This method has been applied for both controlled-and immediate-release solid dispersions60, 61 for e. g., Itraconazole coated on sugar sphere, is made by layering onto sugar beads a solution of drug and hydroxypropylmethylcellulose (HPMC) in an organic solvent of dichloromethane and ethanol. A solid solution of drug in HPMC is produced upon coating (cosolvent evaporation) and controlled drying of coated beads in a closed Wurster process. Electrostatic Spinning Method: The electrostatic spinning method technology used in the polymer industry combines solid solution /dispersion technology with nanotechnology 62, 63. In this process, a liquid stream of a drug/ polymer solution is subjected to a potential between 5 and 30 kV. When electrical forces overcome the surface tension of the drug/polymer solution at the air interface, fibers of submicron diameters are formed. As the solvent evaporates, the formed fibers can be collected on a screen to give an on woven fabric, or they can be collected on a spinning mandril. The fiber diameters depend on surface tension, dielectric constant, feeding rate, and electric field strength 64. Direct Capsule Filling: The filling of semi solid materials into hard gelatin capsules as melts, which solidify at room temperature, was first done in1978. Direct filling of hard gelatin capsules with the liquid melt of solid dispersions avoids grinding-induced changes in the crystallinity of the drug. A surfactant must be mixed with the carrier to avoid formation of a drug-rich surface layer (e.g., poly-sorbate80 with PEG, phosphatidyl choline with PEG) 65, 66. The temperature of the molten solution should not exceed ~70-C because it might compromise the hard-gelatin capsule shell. Surface- Active Carriers: Two of the important surface-active carriers are Gelucire 44/14and Vitamin ER- alpha- tocopherylpolyethyleneglycol 1000 succinate (TPGS). Gelucire44/14 has commonly been used in solid dispersion for the bioavailability enhancement of drugs. A commonly used surfactant, Polysorbate 80, when mixed with solid PEG, has also been reported to be an alternative surface-active carrier 67, 68, 69. Dissolution testing (particulate or intrinsic): Drugs having intrinsic dissolution rate < 0.1 mg/cm2//min usually exhibit dissolution rate limited absorption 71. Comparison of dissolution profile of drug, physical mixtures of drug and carrier and solid dispersion may help to indicate the mechanism of improved release of drug (solubilization / wetting / particle size reduction). Scanning electron microscopy (SEM) polarization microscopy: Used to study the morphology of drug and sometimes the polymorphism of drug. The fine dispersion of drug particles in the carrier matrix may be visualized. Infrared spectroscopy (IR): Helpful in determining the solid state of the drug (molecular dispersion, amorphous, crystalline or a combination) in the carrier regardless of the state of the carrier. Crystallinities of under 5-10% cannot generally be detected. Differential Scanning Calorimetry (DSC): Changes in the physical state of solid dispersion may occur during heating, and the presence of polymer may influence the melting behavior of drug (e.g. melting point depression).Results need to be confirmed by another technique. Crystallinities under 2% cannot generally be detected. Differential Scanning Calorimetry (DSC): Changes in the physical state of solid dispersion may occur during heating, and the presence of polymer may influence the melting behavior of drug (e.g. melting point depression).Results need to be confirmed by another technique. Crystallinities under 2% cannot generally be detected 72. CONCLUSION: Solid dispersion systems have been realized as extremely useful tool in improving the dissolution properties of poorly water-soluble drugs. In recent years, a great deal of knowledge has been accumulated about solid dispersion technology, but their commercial application is limited. Two trends strongly favor an increasing role for solid dispersions in pharmaceutical development: the increasing number of drug candidates which are poorly soluble, and the substantial improvements in the manufacturing methods for solid dispersions that have been made in the last few years. The possibilities of combining several carriers to produce an optimized product further extend the range of possibilities for formulation. Yet another advantage of solid dispersion over other approaches is that the increase in solubility and the release rate that can be achieved are often much, upto orders of magnitude. This could potentially lead to an increase in bioavailability that is so great that the dose administrated could be lowered. Wadke DA, Serajuddin ATM, Jacobson H, Lieberman, HA, Lachman L, Schwartz JB and Marcel D : Preformulation testing In Pharmaceutical Dosage Form, New York, 1,1989: 1-73. Sekiguchi K and Obi N: studies on absorption of eutectic mixture, a comparison of the behavior of eutectic mixture of sulfathiazole and that of ordinary sulfathiazole in man. Chem Pharm Bull 1961; 9: 866-872. Chiou WL and Riegelman S: Pharmaceutical applications of solid dispersion system. J Pharm Sci 1971; 60: 1281-1302. Goldberg AH, Gibaldi M and Kanig JL: Increasing dissolution rates and gastrointestinal absorption of drugs via solid solutions and eutectic mixtures II. Experimental evaluation of eutectic mixture: urea-acetaminophen system. J Pharm Sci 1966; 55: 482-487. Goldberg AH, Gibaldi M and Kanig JL: Increasing dissolution rates and gastrointestinal absorption of drugs via solid solutions and eutectic mixtures III. Experimental evaluation of griseofulvin-succinic acid solution. J Pharm Sci 1966; 55: 487-492. Serajuddin ATM: Bioavailability enhancement of poorly water-soluble drugs by solid dispersion in surface active and self-emulsifying vehicles. Bull Technique Gattefosse 1997; 90: 43-50. Ford JL: the current status of solid dispersions. Pharm Acta Helv 1986; 61: 69-88. Goldberg AH, Gibaldi M, Kanig JL and Mayersohn, M: Increasing dissolution rates and gastrointestinal absorption of drugs via solid dispersion in eutectic mixtures IV. Chloramphenicol-urea system. J Pharm Sci 1969; 58: 1505-1509. Dhirendra K, Lewis S, Udupa N and Atin K. Solid dispersions: A review. Pak J Pharm Sci 2009; 22: 234-246. Pouton CW: Formulation of poorly water–soluble drugs for oral administration-Physicochemical and physiological issues and the lipid formulation classification system. Eur J Pharm Sci 2006; 29: 278- 287. Chiou WL and Riegelman S: Preparation and dissolution characteristics of several fast-release solid dispersions of griseofulvin. J Pharm Sci 1969; 58: 1505-1509. Summers MP, Enever RP: Preparation and properties of solid dispersion system containing citric acid and primidone. J Pharm Sci 1976; 65: 1613-1618. Allen LV, Yanchick VA and Maness DD: Dissolution rates of corticosteroids utilizing sugar glass dispersions. J Pharm Sci 1977; 66: 494-497. Timko RJ and Lordi NG: Thermal characterization of citric acid solid dispersions with benzoic acid and Phenobarbital. J Pharm Sci 1979; 68: 601-605. Lin CW and Cham TM: effect of particle size on the available surface area of nifedipin-poly(ethyleneglycol) 6000 solid dispersions. Int J Pharm 1996; 127: 261-272. Mura P, Manderioli A, Bramanti G and Ceccarelli L: Properties of solid dispersion of naproxen in various poly(ethyleneglycol)s. Drug Dev Ind Pharm 1996; 22: 909-916. Owusu-Ababio G, Ebube NK, Reams R and Habib M: Comparative dissolution studies for mefenamic acid-poly-(ethylene glycol) solid dispersion systems and tablets. Pharm Dev Technol 1998; 3: 405-412. Simonelli AP, Mehta SC and Higuchi WI: Dissolution rates of high energy poly(vinylpyrrolidone)(PVP)-sulfathiazole co-precipitates. J Pharm Pharmacol 1977; 29: 783-784. Patro S and Choudhary AA: Effect of some hydrophilic polymers on dissolution rate of roxithromycin. Ind J Pharm Sci 2005; 67: 334-341. Pouton CW: Formulation of poorly water–soluble drugs for oral administration-Physicochemical and physiological issues and the lipid formulation classification system. Eur J Pharm Sci 2006; 29:278- 287. Theodore DS: Remington-The Science and Practice of Pharmacy, Solubility and Phase Equilibria, Mack Publishing Company, Nineteenth Edition 1995; 1:197-198. Babu VR, Areefulla SH and Mallikarjun V: The mechanism of drug release from solid dispersion. J Pharm Res. 2010; 3(1):142. Betageri GV and Makarla KR: Enhancement of dissolution of glyburide by solid dispersion and lyophilization techniques. Int J Pharm 1995; 126:155-160. Karatas A, Nilufer Y and Baykara T: Improved solubility and dissolution rate of piroxicam using gelucire 44/14 and labrasol. IL Farmaco 2005; 60: 777-782. Tantishaiyakul V, Kaewnopparat N and Ingkatawornwong S: Properties of solid dispersions of piroxicam in polyvinylpyrrolidone k-30. Int J Pharm 1996; 143: 59-66. Noyes AA and Whitney WR: The rate of solutions of solid substances in their own solutions. J Am Chem Soc 1897; 19: 930-934. Galia E, Nicolaides E, Hoerter D, Loebenberg R, Reppas C and Dressman JB. Evaluation of various dissolution media for predicting in vivo performance of class I and II drugs. Pharm Res 1998; 15: 698-705. SaharanVA, Kukkar V, Kataria M, Gera M and Choudhary PK: Dissolution Enhancement of Drugs. Part I: Technologies and Effect of Carriers. Int J Health Res 2009; 2(2): 107-124. Khan GM: Controlled release oral dosage forms: some recent advances in matrix type drug delivery systems. The Science 2001; 1: 350-354. Amidon GL: A theoretical basis for a biopharmaceutics drug classification-The correlation of in vitro drug product dissolution and in vivo bioavailability. Pharm Res 1995; 12: 413-420. Lobenberg R, Amidon GL: Modern bioavailability and bioequivalence and biopharmaceutics classification system. 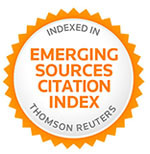 New scientific approaches to international regulatory standards. Eur J Pharm Biopharm 2000; 50: 3-12. Bergstrom CA, Strafford M, Lazorava L, Avdeef A, Luthman K and Artursson P: Absorption classification of oral drugs based on molecular surface properties. J Med Chem 2003; 46:558-70. Chiou WL and Riegelman S: Pharmaceutical applications of solid dispersion systems. J Pharm Sci.1971; 60(9):1281-1302. Craig D Q M: The mechanisms of drug release from solid dispersions in water-soluble polymers. Int J Pharm 2002; 231: 131-144. Vasconcelos T, Sarmento B and Costa P: Solubility enhancement as strategies to improve oral bioavailability of poorly water soluble drugs. Drug Discovery Today 2007; 12:1281-1302. Sekiguchi K, Obi N and Ueda Y: Studies on absorption of eutectic mixture. ii. Absorption of fused conglomerates of chloramphenicol and urea in rabbits. Chem Pharm Bull 1964; 12:134-144. Lloyd GR, Craig DQM and Smith A. A calorimetric investigation into the interaction between paracetamol and polyethylene glycol 4000 in physical mixtures and solid dispersions. Eur J Pharm Biopharm 1999; 48: 59-65. Chiou WL, and Riegelman S: Preparation and dissolution characteristics of several fast- release solid dispersions of griesofulvin systems. J Pharm Sci 1969; 58:1505-1510. Li FQ, Hu JH, Deng JX, Su H, Xu S and Liu JY: In vitro controlled release of sodium ferulate from compritol 888 ATO- based matrix tablets .Int J Pharm 2006; 324:152-157. Yakou S, Umehara K, Sonobe T, Nagai T, Sugihara M and Fukuyama Y: Particle size dependency of dissolution rate and human bioavailability of phenytion powders and phenytion-poly(ethylene glycol) solid dispersions. Chem Pharm Bull 1984; 32: 4130-4136. Vippagunta SR, Wang Z, Horhung S and Krill SL: Factors effecting the formation of eutectic solid dispersions and their dissolution behaviour. J Pharm Sci 2007; 96: 294-304. Lin CW and Cham TM: Effect of particle size on that available surface area of nifedipine from nifedipine-polyethylene glycol 6000 solid dispersions. Int J Pharm 1996; 127: 261-272. Serajuddin, ATM. Solid dispersion of poorly water soluble drugs: early promises, subsequent problems, subsequent problems and recent breakthroughs. J Pharm Sci 1999; 88:1058-1066. Taylor LS and Zografi G: Spectroscopic characterization of interactions between PVP and indomethacin in amorphous molecular dispersions. Pharm Res 1997; 14:1691-1698. Mooter Van Den G, Weuts I, Ridder Td and Balton N: Evaluation of inutec SPI as a new carrier in the formulation of solid dispersions for poorly water soluble drugs. Int J Pharm 2006; 316:1-6. Dannenfalser RM, He H, Joshi Y Bateman S and Serajuddin ATM: Development of clinical dosage forms for a poorly water soluble drug: application of polyethylene glycol- polysorbate 80 solid dispersion carrier system. J Pharm Sci 2004; 93:1165-1175. Verreck G, Decorate A, Heymans K, Adriaensen J, Cleeren D, Jacobs A, Liu D, Tomasko D, Arien A, Peters J, Rombaut P, Mooter Van Den G and Brewster ME: The effect of pressurized carbon dioxide as a temperorary plasticizer and foaming agent on the hot stage extrusion process and extrudate properties of solid dispersions of itraconazole with pvp- va 64. Eur J Pharm Sci 2005; 26: 349-358. Verreck G, Decorate A, Heymans K, Adriaensen J, Cleeren D, Jacobs A, Liu D, Tomaskon D, Arien A, Peters J, Rombaut P, Mooter Van Den G and Brewster ME: Effect of supercritical carbon dioxide as a reversible plasticizer and foaming agent on the Hot Stage extrusion of itraconazole with EC 20 cps. J Supercritical Fluids 2007; 40:153-162. Gupta MK, Tseng YC, Goldman D and Bogner RH: Hydrogen bonding with adsorbent during storage governs drug dissolution form solid dispersion granules. Pharm Res 2002; 19:1663-1672. Seo A, Holm P, Kristensen HG and Schaefer T: The preparation of agglomerates containing solid dispersions of diazepam by melt agglomeration in a high shear mixer. Int J Pharm 2003; 259:161-171. Vilhelmsen T, Eliasen H and Schaefer T: Effect of a melt agglomeration process in agglomerates containing solid dispersions. 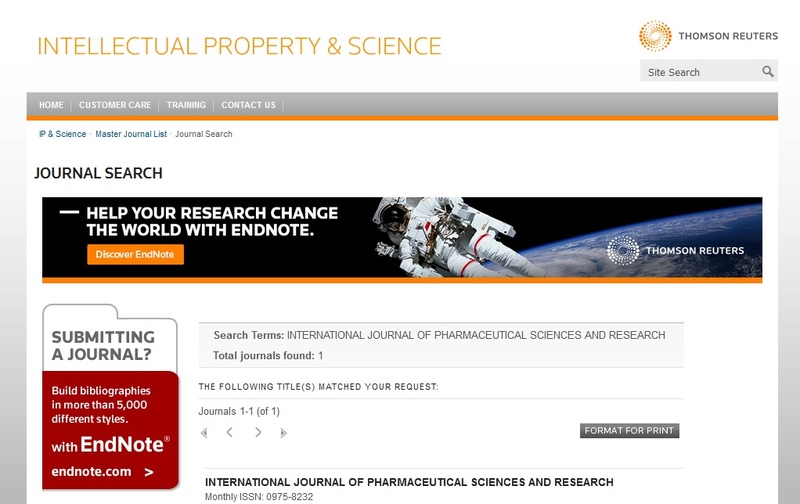 Int J Pharm 2005; 303: 132-142. Rodier E, Lochard H, Sauceau M, Letoureneau JJ, Friess B and Fages J: A three step supercritical process to improve the dissolution rate of eflucimibe. Eur J Pharm Sci 2005; 26: 316-193. Won DH, Kim LS, Lee S, Park JS and Hwang SJ: Improved physicochemical characterization of felodipine solid dispersion particles by supercritical anti-solvent precipitation process. Int J Pharm 2005; 301:199-208. Ahuja N, Katare OP and Singh B: Studies on dissolution enhancement and mathematical modelling of drug release of poorly water–soluble carriers. Eur J Pharm Biopharm 2007; 65: 26-38. Schuleit M, Dahlberg C and Millqvist- Fureby A: Surface composition and contact angle relationships for differently prepared solid dispersion. Eur J Pharm Biopharm 2008; 63:1-8. Majerik V, Charbit G, Badens E, Horvath G, Szokonya L, Bose N and Tiellaud E: Bioavailability enhancement of an active substance by Supercritical Antisolvent Precipitation. J Supercrit Fluids 2007; 40:101-110. Haung J, Wignet RJ, Betzely CM and Schwartz JB: Nifedipine solid dispersion in microparticles of ammonia methacrylate copolymer and ethylcellulose binary blend for controlled drug delivery. Effect of drug loading on release kinetics. Int J Pharm 2006; 319: 44-54. Karanth H: Industrially fisible approach In the manufacture of solid dispersion A technical report AAPS Pharm Sci Tech 2006; 7(4): 84. Beten DB: Preparation of a controlled release coevaporates of dipyridamole by loading neutral pellets in a fluidized –bed coating system. Pharm Res1995; 12(9). Hsiu-O Ho: The preparation and characterization of solid dispersions on pellets using a fluidized-bed Int J Pharm 1996; 139: 223-229. Doshi J and Reneker DH: Electrospinning process and applications of electrospun fibers. Paper presented at: Industry Applications Society Annual Meeting, Toronto, Ontario, Canada, and October 2-8 1993; 3:1698. Reneker DH and Chun I: Nanometer diameter fibres of polymer, produced by electrospinning. Nanotechnology. 1996; 7: 216Y223. Deitzel JM, Kleinmeyer J, Harris D and Beck Tan NC: The effect of processing variables on the morphology of electrospun nanofibres and textiles. Poly 2001; 42: 261-272. Serajuddin, ATM, Sheen PC and Augustine MA: Improved dissolution of a poorly water soluble drug from solid dispersions in poly (ethyleneglycol): polysorbate 80 mixtures. J Pharm Sci. 1990; 79: 463-464. Serajuddin, ATM, Sheen PC, Musfon D, Bernstein DF and Augustine MA: Effect of vehicle amphiphilicity on the dissolution and bioavailability of a poorly water- soluble drug from solid dispersion J Pharm Sci. 1988; 77: 414-417. Dennis AB, Farr SJ, Kellaway IW, Taylor G and Davidson R: In vivo evaluation of rapid release and sustained release Gelucire capsule formulations. Int J Pharm. 1990; 65: 85Y100. Aungst BJ, Nguyen NH and Rogers NJ: Amphiphilic vehicles improve the oral bioavailability of a poorly soluble HIV protease inhibitor at high doses. Int J Pharm. 1997; 156: 79Y88. Sethia S: Solid dispersions-Revival with greater possibilities and applications in oral drug delivery Critical Review Tm in Therapeutic Drug carrier systems 2003; 20(27&3): 215-247. Bretienbach J, Schrof W, and Neumann J: Confocal Raman-spectroscopy-Analytical approach to solid dispersions and mapping of drugs. Pharm Res 1999; 16: 1109-13. Kaplan SA: Biopharmaceutical considerations in drug design and evaluation. Drug Metab Rev 1972; 1:15-34.